What with two out-patient surgeries, plus the discomfort of having to walk around for eight days with a urologic stent implanted in me, your humble blogger and the missus took in some of the holiday festivities of our newly adopted home city. What’s a little pain when you can stimulate the local economy and get into the holiday spirit, right? Pass the pain meds and let’s boogie. It’s been 15 years since I last lived in a tourist town. I find it comforting to know that there are all kinds of fun and interesting things just a five or ten minute ride from my home. St. Augustine was settled by the Spanish in 1565, and is the oldest continuously occupied European-established settlement within the borders of the continental United States. Look Ma, proper English! No contractions! We live close enough to the Historic District to get there easily for meals or late afternoon strolling, but far enough away to not ever be too terribly impacted by tourist traffic. In spite of my moving a bit slow for a few days earlier this month, we took in the sights and got into the spirit of the season. Dinner at an Old City Spanish taverna. Unfortunately I used the flash, so it looks like it’s in the middle of the afternoon when in fact it was around 7:00pm and already dark. The “Nights of Lights” runs from November 18 to January 31, 2018. There are a myriad of ways to see it including trolley and boat. But “Mr. Stent” stubbornly insisted on seeing it all on foot. I suggested to Gorgeous that next year we should ride the trolley because it looks like fun. I’m not certain for sure, but I thought I caught her rolling her eyes at that very moment. It’s hard to be certain in the dark, though. Nevertheless, the sights were beautiful! The Lightner Museum is featuring the “Dressing Downton” exhibit till January 7, 2018. A wonderful smattering of outfits representing the show’s upstairs and downstairs characters are displayed. A speaker system overhead quietly plays the very recognizable theme music heard on each episode, which to no one’s surprise is also available at the exhibit gift shop. Of course, it seemed only right that we bought the CD. What would December be without a holiday concert? 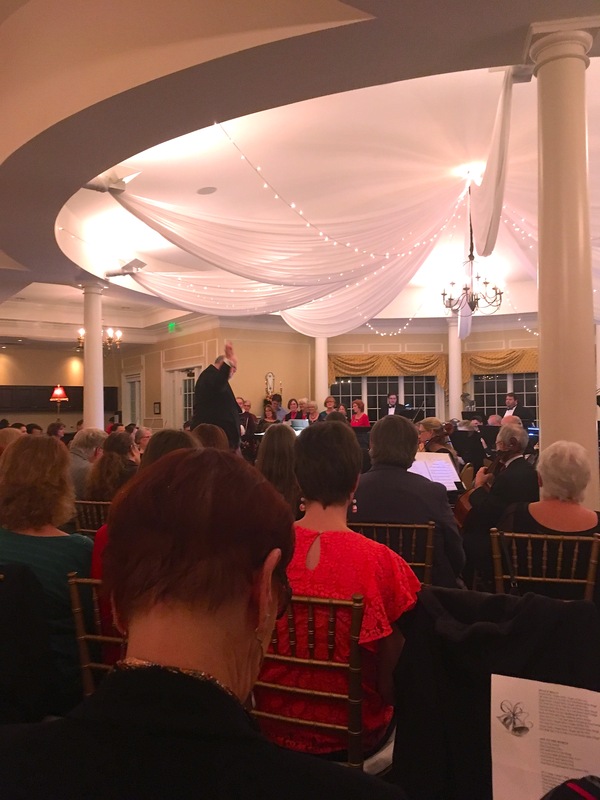 During the early part of the month, we attended a concert put on by the St. Augustine Symphony. It’s really kind of gauche to take a picture at the symphony, but have you noticed how there’s always that one person who nonetheless does? Dude, you’re not at a Bon Jovi concert. We were very fortunate to be able to get out and enjoy so much during a typically slow time of the year here. We knew something was amiss when parking spots were available on the street right in front of nearly every place we visited. If only I had gotten that tin of Mrs. Patmore’s pudding tea. OMG! Loser took me there for my 50th but I sure didn’t get to see any of this cool stuff! We did see the old fort. Well, if you have any height at all, you’ll be hard pressed to be able to stand upright in several parts. Oh my! I hate when they stick foreign parts in my body! Glad you are better and walking may be better than bouncing on a boat or trolley. 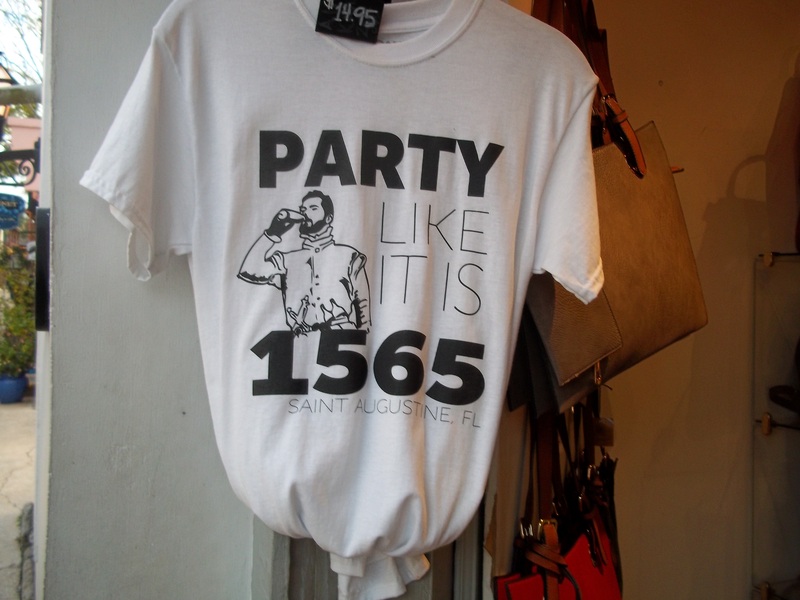 I was in St. Augustine a long time ago. I’m sure it’s much different but you painted a wonderful picture of it. Have a great holiday! Thanks, Kate. Yes, all is better now. They removed a fairly large kidney stone from me that I really didn’t even know was there (thankfully). The stent was way worse than the stone this time. 🙂 St. Augustine has so much to do, and I think we’ve really only covered about a quarter of it since we’ve moved here. You have a wonderful holiday too! Hi, Marty – I’m glad to hear that you are feeling better. I LOVED the tour, the pics….and the pillows! Wishing you and Gorgeous a happy and healthy holiday season. Thanks, Donna! I wish the same for you and yours too. Hope you’re feeling well! That trolley might’ve been a good idea this year! Anyway, I love St. Augustine, and I’ve always wanted to explore Flagler. Much better thanks, Leslie. Yes, so much to see and explore here. We were talking last night about whether indeed we’ll stay here “forever.” I doubt we will, but I suspect we’re here for at least 10 years until the hurricanes eventually chase us away. 🙂 So much to see before then, though! Looks like fun despite your ummmm…. limitations. 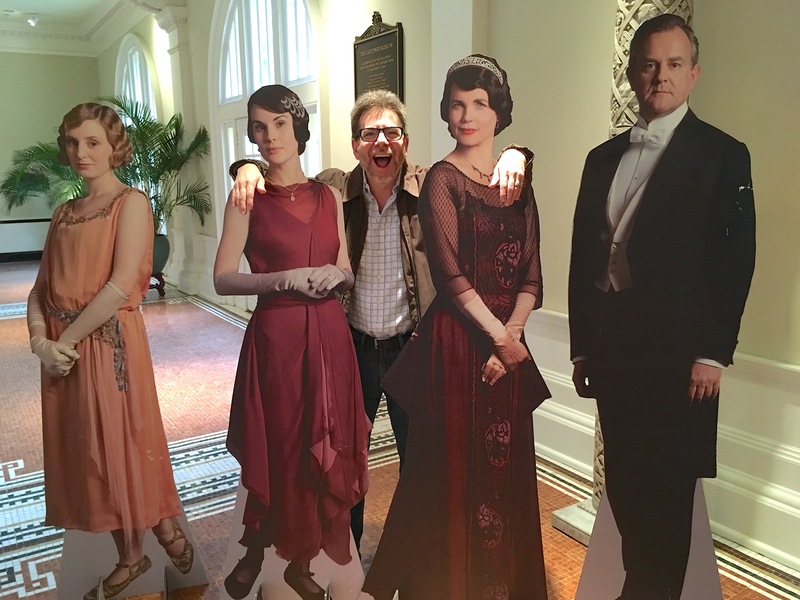 I love the picture of you and your Downton buddies. Every family has a ne’er-do-well relative. My city is a tourist town too. It has its pluses, but it’s nice when they all go away. Best to you and Gorgeous in 2018! Thanks, Janice! Yeah, it was really great to see all of those wardrobes and extras they had for viewing. And I agree — I think I offer something important to the Grantham. 🙂 Have a wonderful 2018 to you too! Fashion exhibits are all the rage now. The Met and MoMA focus on them becuase they really pull in the crowds. And crowds = $. Merry Christmas, pal. Happy New Year, too. I liked the TV show quite a bit, but I really thought the clothing exhibit might be a bore. It was more interesting than I thought. Thanks so much! You have a wonderful New Year also. Oh, man, we would love that. I haven’t been there since the nineties. I think I’m way overdue!